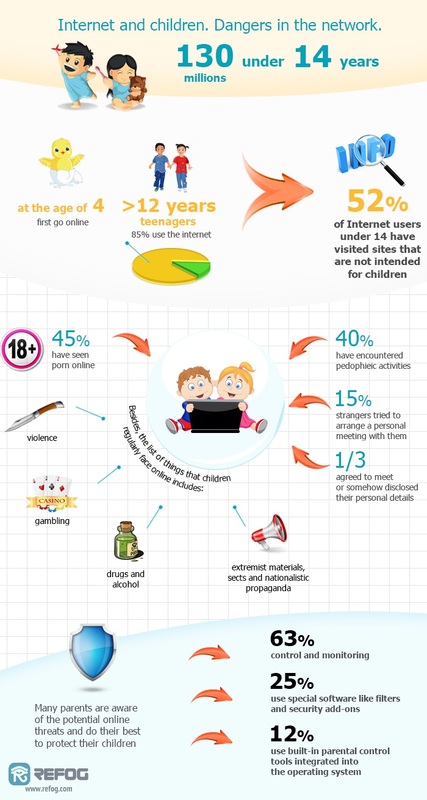 Are you concerned about what your children are doing online? Do you feel safe about them chatting with strangers, browsing through all the various Web sites and playing random Flash games? The dangers of careless online behaviour are all too obvious to simply ignore. More and more concerned parents are resorting to monitoring their children’s online activities with parental control software. Look after your kids closer with REFOG Personal Monitor! This parental control tool helps you keep a watchful eye on your children, save history of their chats with strangers and monitoring their online activities. REFOG Personal Monitor records everything they do on their computer, log their every action and notify you immediately if their safety and well-being is being threatened. How late is too late? Don’t be guessing! REFOG Personal Monitor notifies you immediately if some sort of threatening activity happens. How does it know it’s a threat? It doesn’t – but you do! You can configure which events require instant attention be it a restricted Web site they attempted to visit or a threatening keyword that they typed. False alarms are virtually eliminated with available pre-defined templates. Our tools are extremely parent friendly. Even if you have a young computer genius growing up in your house, she still won’t notice REFOG Personal Monitor is running. And even if she does, disabling or removing the tool will require her enter the master password - a password that only you know. Access information collected with REFOG Personal Monitor from anywhere! With convenient remote access features, you can review conversations, chats and other activities of your kids as if you were at home. No need rushing home during the launch hour just to check the logs! Do you prefer plain text or pictures? With REFOG Personal Monitor you can have both! The tool can take screen shots of your computer desktop with given intervals, displaying all applications running and every window open. Not that you’d normally want to print anything, but chat logs produced by REFOG Personal Monitor are laid out nicely and formatted conveniently. Chat logs intercepted by REFOG Personal Monitor are not just series of captured key presses. Instead, every message is accompanied with a timestamp and recipient, and each chat log is identified separately for your convenience. It’s not easy to fool young computer geniuses, but we try hard – and succeed. Employing advanced invisible techniques, our parental control tool is highly discreet, and does not easily reveal its presence. REFOG Personal Monitor does not appear in the processes list and does not show in the Task Manager. There’s no icon near the system clock or anywhere else. In fact, if you don’t know for sure you have REFOG Personal Monitor installed you’d be hard pressed to tell!